Perfect for your friends who live in snowy climes. Make it Hoth for them! From ThinkGeek... your friends will be excited to have Darth Vader and R2 on their wrists. A brand new TV series means brand new action figures, and Hasbro has put out a ton in the past few months. Including this set that comprises Zeb and a Stormtrooper. 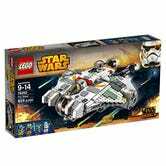 LEGO has also put out a ton of Star Wars: Rebels toys, including this set that lets you assemble the new ship, the Ghost. And then there's this set of plushy figures from Comic Images, including The Inquisitor. Sadly without the new rectangular attachment, but you can't have everything. From Quantum Mechanix. This ThinkGeek creation fits within airlines' overhead space restrictions, and will help your friends smuggle those Death Star plans on their next trip. Show your allegiance with this new T-shirt from Her Universe! Also from ThinkGeek... not sure about this one. Might just be a tad too creepy, actually. Based on those commemorative plates that they put on the side of ships, this has insanely detailed specs for the AT-AT, and will set you back a whopping $1,995 from Acme Archives Direct. For when your friend is doing the Downward Facing Dagobah. Also from ThinkGeek. Even with a lot of R2D2 themed items out there, this is especially ingenious.